Monica Mariano worked on a photo shoot in Framingham. She calls herself a “messy cook,” but her presentations are tightly controlled. It’s a detailed process that could include using fake ice cubes that don’t melt under hot studio lights or tweezers to move an errant peppercorn. But these are not your mother’s McCall magazine still shots of red gelatin mold or mashed potatoes. Today’s food stylist is aiming at the Instagram audience. One London restaurant even put glitter in its gravy, the better to dazzle on social media. This is what food stylist Monica Mariano is up against as a veteran foodie working for the Boston talent agency Ennis. Mariano, 43, is an unassuming brunette whose work uniform is jeans, sneakers, and a striped apron. She sometimes wears sunglasses on set, not for the diva look, but to prevent headaches from the bright lights. She calls herself a “messy cook,” but her plated dishes are spectacularly appealing, and her clients include Kraft foods, Baskin Robbins, Boston Beer, Ben & Jerry’s, and Everyday with Rachael Ray. Even nonfood companies such as Century 21 and Fidelity ply Mariano’s skills for creative storytelling, such as spelling out a logo in pomegranate seeds. (The trick is to work quickly before the seeds start drying out). Monica Mariano worked on a photo shoot. She arranged carrots so they look like a lobster, spelled out corporate logos in pomegranate seeds, and made gingerbread houses look like a fitness gym. “I grew up in the food industry and it was so difficult I swore I would never do it again. It’s long hours on your feet, and not necessarily financially rewarding. My parents were Italian immigrants and owned a deli in Waltham. I ran the cold cut slicing machines, stocked shelves, and made pasta and platters. 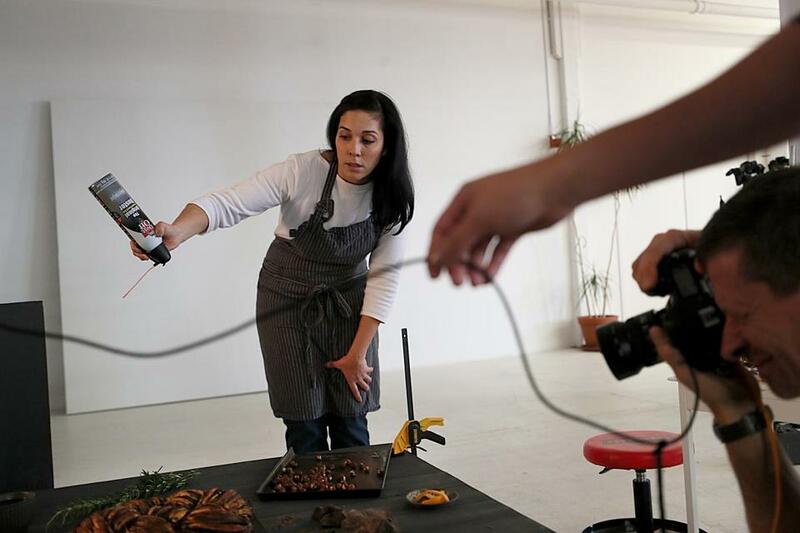 Food has been glamorized on cooking shows and reality chefs, but it’s not a fancy job, for sure. So I went to college for broadcasting instead but found myself always doing something with food on the side despite my best intentions. I worked in a sardine company, baked cakes for friends, and did an internship at a test kitchen. When they didn’t hire me full time, I was devastated. I waitressed and worked at a bakery, and through connections, assisted food stylists for photo shoots. One day, one of them turned to me and said — I’ll never forget this — ‘You would be good at this.’ Thanks to her, I started testing with photographers and built a portfolio. A huge part of my work today is building content for social media posts. 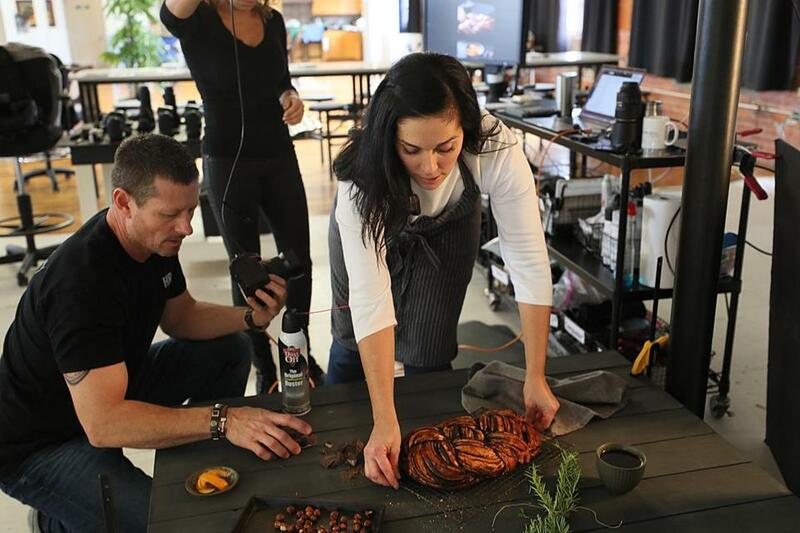 Stop-motion videos, like soup being swirled, or entertaining animations of dancing cookies, are more interactive than traditional still images. Creative directors send me ideas and ask if I can help bring them to life. There’s a lot of problem-solving. How do I arrange carrots so they look like a lobster? Do these gingerbread houses look like a fitness gym? Where can I find a market that carries turducken (deboned chicken and duck stuffed inside a turkey)? can be reached at cindy@cindyatoji.com.